Over the six decades that he devoted to art, Antoni Tàpies, now universally recognised as one of the most important artists working in the second half of the 20th century, always showed his concern about the humanity’s problems and conflicts. In his painting, which was often austere yet, at the same time, full of force and expression, he seeks to find his own personal iconography, to respond to the basic questions about human beings and to demonstrate that beauty and transcendence can often be found in the humblest objects. Antoni Tàpies was born in Barcelona in 1923 into a well-to-do Catalan family, cultured, political and bookish, who transmitted to him the love for books, reading and culture in general. He saw the disasters of the Spanish Civil War whilst in his teens, and this was an experience that would mark him forever. Later, whilst still very young and suffering from a lung disease, he was forced to spend a long period convalescing at a sanatorium, a time he used to read, think and make his first drawings. His reading there included The Book of Tea, which introduced him to Oriental culture and philosophy, thereafter a constant influence and presence in his art. Having recovered, he began studying Law in Barcelona, but dropped out during the final year to devote himself fully to painting. His first painterly explorations, produced in the late-1940s and early-1950s and still marked by Surrealism, provided him with a base for research into physical nature of objects and their materiality. Very soon, though, his work began to focus on the search for new expressive parameters in which texture played a key role. He quickly began to produce works with relief, fragments torn off, lacerations, rips, etc., alluding to the horrors of the Civil War and linking him to informalism and to American abstract expressionism. He later began to incorporate doors, windows and the human body, and to use collage and assemblage in highly personal work that won him international recognition. 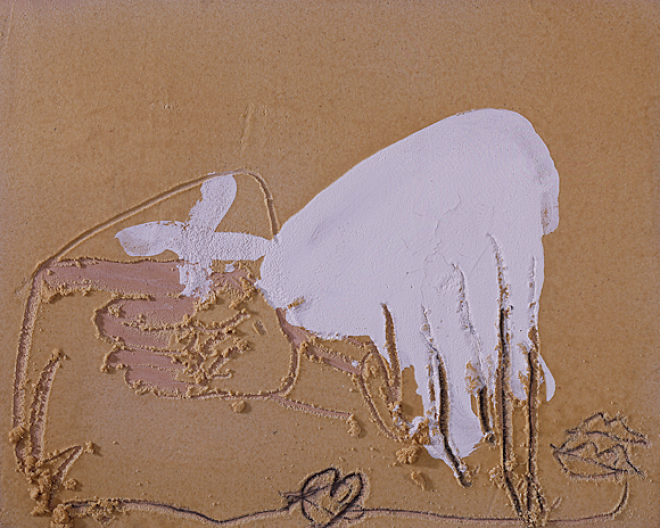 Today, the work of Antoni Tàpies forms part of numerous public and private collections, including those of the Tate Gallery in the United Kingdom, MoMA in New York, the Galleria Nazionale d’Arte Moderna in Rome, the Musée d’Art Moderne and the Centre Georges Pompidou in Paris, the Stedelijk Museum in Amsterdam and the Museum of Contemporary Art in Los Angeles, amongst others. 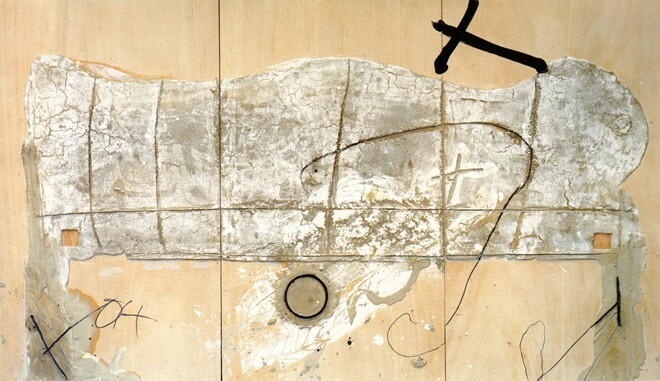 Tàpies also took part in Documenta, and at the Venice Biennale on several occasions. At his last appearance at the Italian festival, in 1993, he installed his work Rin-Zen in the Spanish Pavilion and was awarded the Golden Lion. He also presented countless solo exhibitions at international galleries. These include, particularly, retrospectives at the Guggenheim Museum in New York (1962 and 1995), the Musée d’Art Moderne de la Ville de Paris (1973), the Nationalsgalerie in Berlin (1974), the Louisiana Museum of Art, Denmark (1974), the Hayward Gallery, London (1974), the Seibu Museum of Art, Tokyo (1976), the Albright-Knox Art Gallery in Buffalo – a travelling show that later opened at the Museum of Contemporary Art in Chicago, the Marion Koogler McNay Art Institute of San Antonio (Texas), the Des Moines Art Center (Iowa), and the Musée d’Art Moderne de Montreal, Quebec, Canada (1977) – and the Museo Nacional Centro de Arte Reina Sofía in Madrid (1990), amongst others. The many honours and prizes that Antoni Tàpies received over the course of his life include the Praemium Imperiale, awarded to him by the Emperor of Japan (1990). In 1992, he was made an Honorary Member of the Royal Academy of Arts in London and of the American Academy of Art and Sciences in Cambridge, Massachusetts. In 2003, the French President named the artist Commander of the National Order of the Legion of Honour. 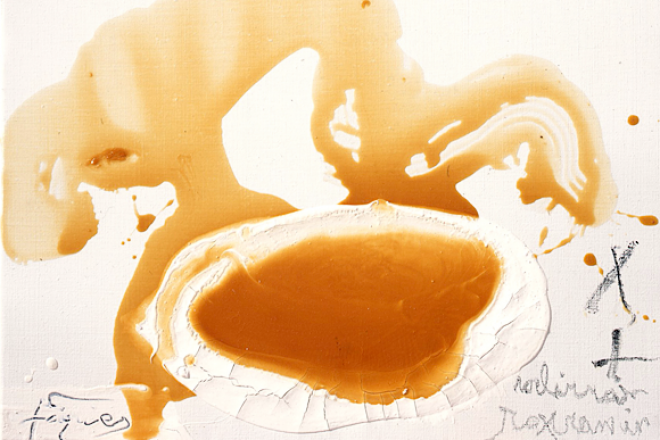 The Antoni Tàpies Foundation was established in Barcelona in 1990. Antoni Tàpies died on 6 February 2012 at the age of 88 years.